The key cleavage opens up between those who have benefited under this ‘almost’ democracy and those who have been failed by it. But, the dynamics of political conflict in Thailand do not fall within the same framework as other global protest mobilisations. Red shirts listen a phone call from former prime minister Thaksin Shinawatra during a rally in 2010. Demotix/Vinai Dithajohn. All rights reserved. The Kingdom of Thailand has had seventeen constitutions since its shift from absolute monarchy in 1932. Since then the Land of Smiles has wrestled with its darker side, particularly throughout the reign of HM King Bhumibol (ascended in 1946; enthroned 1950), who celebrated his eighty sixth birthday this week. Recent history has asked hard questions about Thailand and its regional significance within the Association of South East Asian Nations (ASEAN). There are issues arising from instability within its neighbour, Myanmar (formerly Burma), and the refugee crisis emanating from there. There was also the recent ruling by the ICJ on Thailand’s long running border dispute with Cambodia over the Preah Vihear Temple. There is a nasty and protracted insurgency in its three southernmost provinces, which has largely escaped sustained international attention, even though it has claimed more lives in less than a decade than Northern Ireland’s conflict claimed in over thirty years. And above all there are the inherent tensions and flaws within the Thai social system and its body politic, which have only been held in check by the Thai populace’s universal adoration for its monarch and his unifying power. The King’s reign, now in its sixty seventh year, is drawing to a close. The passing of the monarch will be an unprecedented event in the living memory of most Thais. Through the relative stability of this long reign the Kingdom had always succeeded in maintaining its attractiveness as a commercial hub within a region that was bedevilled by horrific civil wars. Thailand was surrounded by nations that faced acute political and social crises. Vietnam, Cambodia, Indonesia, Myanmar (Burma) and the Philippines are not just fellow ASEAN members. This list of nations is also a list of trouble spots. Thai people pride themselves on never having being colonised and maintaining their national integrity despite the turbulence around them. But the contemporary confluence of de-stabilizing socio-political forces, all of which are overshadowed by the proximate end of the King’s extraordinarily long reign, have arrived just as the rest of the world is once again questioning the various accepted premises of political rule. Thailand is a land of profound contradictions. Tradition and modernity, opulence and poverty are all in close proximity to each other in the capital Bangkok. These dichotomies are also confined to specific regional areas. The underdeveloped areas in the north and east of the country stand in sharp contrast to the central and southern areas. Welfare provision in the Kingdom is thin, and wages are markedly depressed compared to other Asian countries. The political system, though ostensibly democratic, has never functioned as an open democratic state. How could it, in a world region that rarely displayed such a luxury? The key cleavage currently apparent within Thailand – one that directly impacts all the other issues – opens up between those who have benefited under this ‘almost’ democracy and those who have been failed by it. The beneficiaries are primarily counted among the urban and middle class voters of Bangkok, along with the central and southern areas of the country. The more numerous rural poor, by contrast, are largely concentrated in the areas to the north and east of the capital. Here, public services and infrastructure tend to be patchy and many basic services are simply beyond the means of most impoverished Thais. Enter Thaksin Shinawatra, a former police officer turned telecoms tycoon and founder in 1998 of the Thai Rak Thai political party. He campaigned on populist promises of accessible medical care, social services provision, micro credit schemes for farmers, and a promise to end corruption. It was a vote winner. Whether he was ever likely to deliver on his promises or not was irrelevant. Thaksin was swept to power in 2001 and did actually implement part of his program. So popular did he become, achieving almost cult-like status, that those close to traditional power centres saw him as a direct threat to the status quo. He was ousted in 2006, his party disbanded and Thailand’s political landscape since has been anything but stable. However, it is a testament to the salience of the deeper problems within Thailand upon which Thaksin capitalized opportunistically that the newer Pheu Thai party led by his sister, Yingluck, was similarly swept to power in 2011. She currently governs with a significant majority. The current political instability in Thailand, while apparently tallying with global protest movements mobilised around fiscal misgovernment and austerity in the west or opposition to corrupt autocratic regimes in the Middle East, should not necessarily be seen as a ‘liberation’ movement against corruption. It is not quite that simple. The Yellows, the colour around which the Thai middle class and anti-Thaksin supporters have mobilised, are not an oppressed minority. They are in fact the privileged of Thailand, distinct from the majority poor who have been neglected by their compatriots for decades at least. The dynamics of political conflict in Thailand, therefore, do not fall within the same framework as other global protest mobilisations. In short, this politics of neglect has now returned to haunt those in Thailand who held power for a very long time, but failed to undertake necessary political reforms. 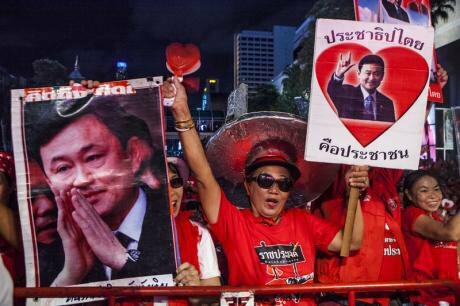 Accusations of corruption levelled against Thaksin and the ‘Redshirts’ (the colour adopted by his supporters) could just as easily be applied to those mobilising against him and the current incumbent, his sister, Yingluck. Suthep, the figure spearheading the current protests, was deputy prime minister when the security forces cracked down on pro-Thaksin protesters in 2010, resulting in over eighty deaths on the streets of Bangkok. Suthep has demanded that Yingluck and her party resign and his protest movement have decided that Monday, December 9, is the final day of reckoning. If an election were to be called thereafter, however, the overwhelming majority of the rural poor would be likely to vote her party back into power. Knowing this, the protest leaders have proposed that the deeply respected King, who usually remains aloof from politics, appoint a ‘people’s council’ following dissolution of Thailand’s elected parliament. Notwithstanding the populist nomenclature, this would, in effect be a return to unelected and elitist government. What is happening in Thailand is the long overdue reckoning of the privileged with the needs of the underprivileged. Simplistic dichotomies of corrupt government versus exasperated populace do not reflect the reality here. The European philosopher Spinoza once wrote that the purpose of revolution is not the fight for justice, but the seizure of power. Numerically superior to the Thai middle class, Thailand’s poor – with genuine grievances – found an imperfect voice in the political opportunism of Thaksin’s quest for power, who in turn capitalized effectively on decades of complacency and neglect by the entrenched elites. Thailand’s protests differ from others in that it is the voice of the underprivileged that has propelled the current incumbent into power, and it is Thailand’s privileged minority who find themselves on the streets breathing teargas.